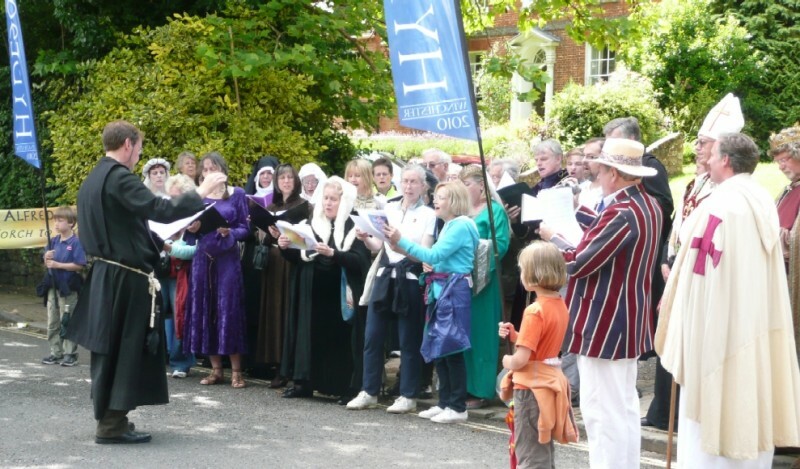 The Hyde 900 Choir first formed to sing a specially composed song entitled, “Welcome Torchbearer!” for the day when the Olympic torchbearer came to Winchester. The words were written by Hampshire Poet Laureate 2012, Brian Evans-Jones, and the music was written by local Hampshire composer, Henrietta Wentworth-Stanley. Sinc that enjoyable day the singers have come together to celebrate special occasions in response to popular requests. We are regularly invited to sing for special services in St Bartholomew’s church, Hyde, Winchester. Not only do we sing traditional English anthems and Christmas carols, but also especially prepared psalms in Anglo-Saxon. This was the language of King Alfred. He personally translated psalms from Latin into Anglo-Saxon so that the English people of his day could hear the words of the psalms in their native tongue. Today we align the words to current church of England chant, bringing the heritage of King Alfred to life once more. We are also invited to sing at special occasions within our community. In 2013 we helped to celebrate the 10th Anniversary of Hyde Abbey Garden with psalms and folk-song. Members of Hyde900Choir include professional and highly experienced choral singers. Due to limited numbers of rehearsals and challenging repertoire, members need to be good sight-readers. We are not currently seeking new members. Director of Hyde900 Choir: Sarah Viersen-Corser. Email: choir@hyde900.org.uk. Mobile: 07875310773. Conductor of Hyde900 Choir: Mark Gilman. Date tbc: Christmas Carols in St Bartholomew’s Church, Hyde, Winchester. Keep an eye on the events diary on this website for more dates.